I have recently returned from a three day trip to the battlefields of the Ypres salient and the Somme with Steve Garnett of Battlefront Exploration (www.battlefrontexploration.co.uk ; @bfXsteve on Twitter). I hope to post a couple of blog articles with some of the photos from the trip over the next few days. After an early crossing on the Eurotunnel and a smooth journey up to the salient we started by visiting Lijssenthoek cemetery. The new visitor centre is quite minimalist (echoing the visitor centre at Tyne Cot), but some of the information is very informative, particularly the ‘timeline’ of the burials in the cemetery. They are carrying out a project similar to the one at Thiepval to collect information and photos about the men who are buried there, which is available to view at the visitor centre and online. In the cemetery itself I was looking for the headstones of three men from Carshalton; my plan is to include the epitaphs from headstones (where they have one) in my book about the men. The headstone of Private James Jasper RAMC, for example, reads “Greatly beloved; deeply mourned”. From Lijssenthoek we continued into Ypres itself, and headed straight to the revamped In Flanders Fields museum. 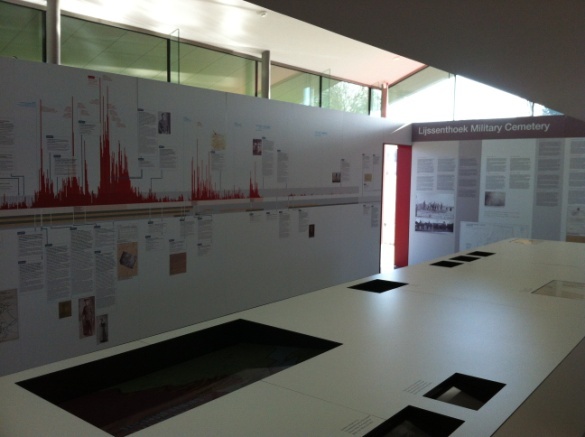 The museum focuses on the Belgian experience of the war, which is understandable, but includes information on soldiers from all the major powers. Technology is well utilised and I found the graphics of the shifting front line particularly useful. The museum does not shy away from death, with some quite graphic pictures that certainly seemed to be grabbing the attention of the many school parties that were there. The highlight of the museum, however, is the opportunity to climb the 231 steps of the bell tower for a panoramic view of the salient itself. It is well worth the 2 Euros although quite a tight squeeze once you are up there! Information boards highlight points of interest, such as Hill 60 and Tyne Cot, and you really get a sense of how flat the landscape is; the rise of the Passchendaele ridge barely perceptible. After a quick stop at Canada Farm cemetery we drove towards Westrozebeke, a small village north of Passchendaele. It was near here that my Great Great Uncle William MacDuff had been killed in action on 2nd December 1917. It was finding out about him that really sparked my interest in the First World War, and visiting where he died was the culmination of a great deal of research into his life and death. Whilst the Passchendaele campaign officially ended on 10th November 1917, operations continued into early December to try and take the northern tip of the Passchendaele ridge. A night attack was carried out on 2nd December involving battalions from two divisions; my Great Great Uncle was one of the 1,687 men who were killed, wounded, or missing that night. 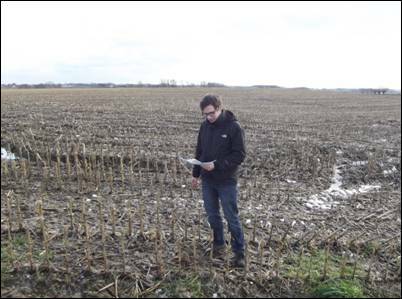 Using aerial photos, trench maps, and operation orders, I had been able to locate the exact area over which William’s battalion, the 11th Border Regiment, had attacked – an area of about 250 yards by 400 yards. Actually seeing the ground really helped to put the attack in context. The battalion’s jumping off point was a depression in the ground; they advanced up a slight ridge and at some point William MacDuff was shot by a machine gun. The battalion were able to take their objective, Mallet Copse, but had to retire due to enemy fire. The copse is now gone but I was able to stand at what would have been the edge, and look across the ground William and his men would have advanced over. William, along with 85 men from his battalion who were killed that night, have no known grave. The fact that they may still be lying under the ground I was standing on was particularly poignant. Some evidence of the war was still visible; an 18 pounder shell, a stokes mortar, and numerous lumps of rusted metal. 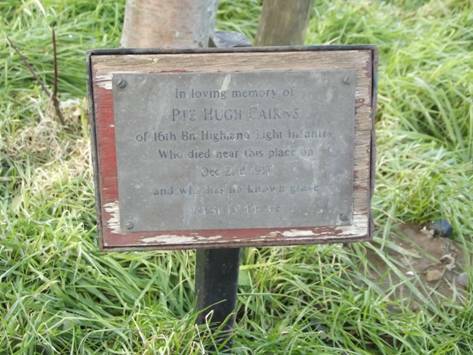 A plaque and tree to a Private of the 16th Highland Light Infantry, who advanced to the right of the Border Regiment, is the only other indication that the area was fought over. After this is was only fitting that we visit Tyne Cot, where William’s name appears alongside nearly 35,000 others who are missing. We headed back to Ypres via Gheluvelt, scene of the dramatic counter-attack by the 2nd Worcesters on 31st October 1914, and the 18th Division memorial at ‘Clapham Junction’. Our last tip of the day was to attend the Last Post ceremony under the Menin Gate. The ceremony never fails to move me, and having been following William’s last moments during the day, was particularly touching. The following morning, we headed south towards Loos and the Somme. This entry was posted in Uncategorized and tagged battlefield trip, Border Regiment, Passchendaele, Ypres. Bookmark the permalink. Nice report Andy. Looking forward to part 2.